Ht / Wt: 6'0" / 225 lb. 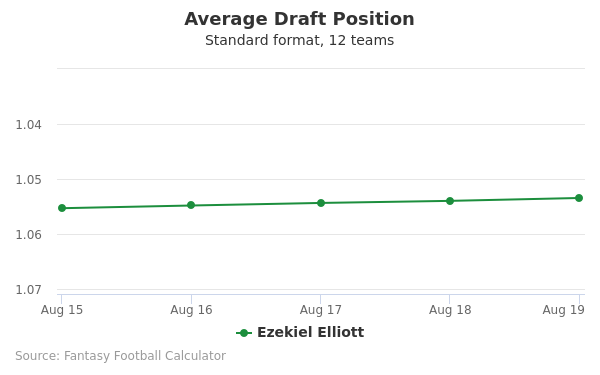 Ezekiel Elliott's fantasy value is measured by his average draft position (ADP) in fantasy football mock drafts. 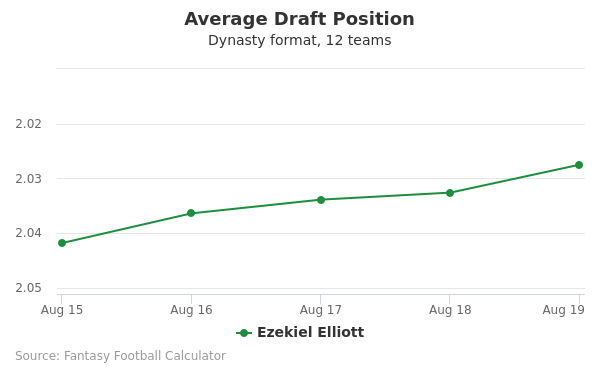 In recent drafts, Elliott's current ADP is 1.01, which indicates that his fantasy outlook is to be the 1st pick of the 1st round, and 1st selection overall. 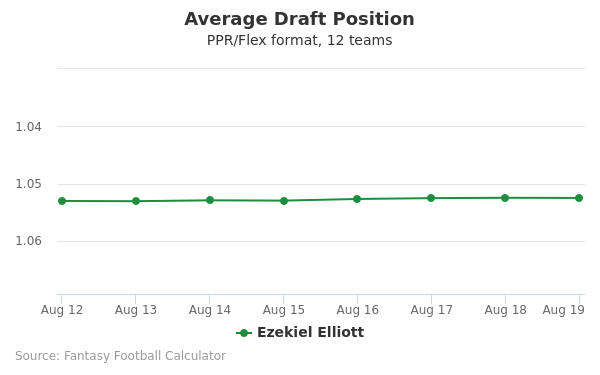 The code below will display a graph that updates every day to show the ADP data for Ezekiel Elliott for the past 30 days in 12-team PPR leagues. Draft Ezekiel Elliott or Saquon Barkley? Draft Alvin Kamara or Ezekiel Elliott? Draft Christian McCaffrey or Ezekiel Elliott? Draft Ezekiel Elliott or Todd Gurley? Draft Ezekiel Elliott or Melvin Gordon? Draft Ezekiel Elliott or LeVeon Bell? Draft DeAndre Hopkins or Ezekiel Elliott? Draft Ezekiel Elliott or James Conner? Draft Davante Adams or Ezekiel Elliott? 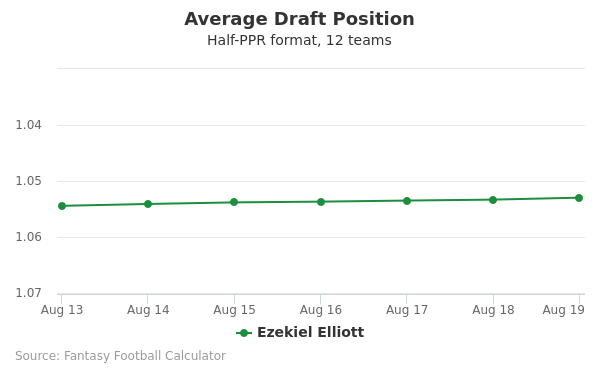 Draft David Johnson or Ezekiel Elliott? Draft Ezekiel Elliott or Julio Jones? Draft Ezekiel Elliott or Michael Thomas? Draft Ezekiel Elliott or Joe Mixon? Draft Ezekiel Elliott or Odell Beckham Jr? Draft Ezekiel Elliott or Tyreek Hill? Draft Dalvin Cook or Ezekiel Elliott? Draft Ezekiel Elliott or Travis Kelce? Draft Ezekiel Elliott or JuJu Smith-Schuster? Draft Antonio Brown or Ezekiel Elliott? Draft Ezekiel Elliott or Nick Chubb? Draft Ezekiel Elliott or Pat Mahomes? Draft Ezekiel Elliott or Mike Evans? Draft Ezekiel Elliott or Marlon Mack? Draft Ezekiel Elliott or Zach Ertz? Draft Damien Williams or Ezekiel Elliott? Start Antonio Brown or Ezekiel Elliott? Start Ezekiel Elliott or Pat Mahomes? Start Ezekiel Elliott or Mike Evans? Start Ezekiel Elliott or Marlon Mack? Start Ezekiel Elliott or Zach Ertz? Start Damien Williams or Ezekiel Elliott? Ezekiel Elliott is number 21 and a running back for the Dallas Cowboys. Drafted by the Cowboys fourth overall in the 2016 NFL Draft, he started as running back in his rookie season. He signed a four-year, $24,956,341 contract, including a $16,350,066 signing bonus, with $24,506,340 guaranteed, and an average annual salary of $6,239,085. He's run a 4.45-second 40-yard dash, and he has a 32 1/2 inch vertical jump - a nearly record breaking 40 time. Elliot started strong in his first game of 2016, against the New York Giants. He had 20 rushing attempts for 51 rushing yards. He also scored his first career touchdown. Elliot continued his strong start against the Washington Redskins with 21 carries for 83 yards. The next week against the Chicago Bears, Elliot had 30 rushing attempts for 140 rushing yards - this was his first game with over 100 yards. Elliot then went on to have a four-game streak of games with more than 100 rushing yards. By the ninth game of the season, Elliot rushed more than 1,000 yards combine - only the second Cowboys rookie ever to achieve this. Tony Dorsett achieved this first in 1977. He also set a record to become the third running back to rush 1,000 yards after only nine games. The only other running backs to achieve this were Adrian Peterson and Eric Dickerson. In Week 15, after scoring against Tampa Bay, Elliott beat another record. He ran 159 yards in the game. This beat out Tony Dorsett and Herschel Walker Cowboys rookie records. Elliot was chosen as a First-team All-Pro, and he also earned his first Pro Bowl. He and fellow rookie quarterback Dak Prescott became the first rookie duo selected in NFL history. The Cowboys played the Packers in divisional playoffs, and Elliot made 22 runs for 125 yards. He and Duane Thomas were the only Cowboy rookies to rush over 100 yards in a playoff game. Elliott attended Ohio State University and started as second string as a freshman. He moved to the starting position in his second year and began setting new records. During the 2014 Big Ten Championship game, he ran for 220 yards on 20 carries and scored two touchdowns. In the 2015 season, Elliott rushed over 100 yards for ten straight games. He also announced that he would be entering the 2016 draft. By the time he left OSU, he had tied several OSU favorites like Eddie George and Archie Griffin for records, and he had also set several of his own. Elliott attended John Burroughs School in Ladue, Missouri. He was a four-sport athlete - he played football, basketball, ran track, and he also played baseball. He played running back for his football team and led his team to three straight title games. As a high school junior, he was named the St. Louis Post-Dispatch offensive player of the yearr. In one season, he rushed 1,802 yards, and he had 34 touchdowns. He received 23 passes for 401 yards and six scores. In his senior year, he had 3,061 all-purpose yards and 50 total touchdowns, including 2,155 rushing yards and 40 rushing touchdowns. Elliot is currently under investigation by the NFL for domestic violence. The investigation has been ongoing for months, and the NFL has not set a date for it to conclude. Elliots dog Ace has his own Instagram account @theaceelliott. And his Instagram is: @EzekielElliott. For jerseys, memorabilia and autographs, see here.